The stand-up guard pass, or Carlson Gracie guard pass is a method of opening the closed guard whose creation is attributed to the late Master Carlson Gracie. The original position consisted on controlling the guard player‘s gi collars (both) with one hand and controlling one of his hands with the guard passer’s free hand, this way nullifying the majority of attacks available from the closed guard when the passer stood up (the key point of the position). The passer would then use the hand controlling the collars to push on the guard player’s legs, this way prying open the guard. Although the closed guard is not currently regarded as a modern style of guard play, its creation/appearance in jiu jitsu dates back to the early 1980’s, being credited to Sérgio Penha, Pascoal Duarte, Márcio Santos and Otávio “Peixotinho”. This style of guard playing was rapidly absorbed by many of the top jiu jitsu competitors, being applied often and with great success in tournaments across Rio de Janeiro. The original solution for the closed guard was to try and pry it open by sinking the elbows on the guard player’s thighs. This technique had a relatively short shelf life as it was hard to perform at a competitive (high) level. In the mid 1980’s, Carlson Gracie came up with what we now know to be the stand-up guard pass. This was the first safe way to dismantle the unsolvable puzzle that was the closed guard game at the time and was regarded, as one of the first big breakthroughs for modern day jiu jitsu. 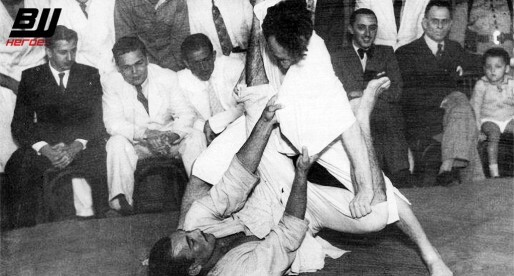 The Carlson Gracie pass was often associated with the stack pass (applied once the guard was open), a combination that became a big part of his student’s success at the highest level of the sport at the time. Though the initial method used to complete the pass once the guard was opened was the stack, Carlson Gracie’s closed guard break is highly versatile, and allows a wide combination of guard passing variations. The control used to stand up has also evolved, and many profess both hands on collar, or a hand on collar and one hand on hips. Banner picture by Jiu Jitsu Style Magazine.